Ario is one of the most prominent, largest and oldest manufacturers and exporters of ORGANIC Dry Dates and ORGANIC Fresh Dates in the world. We’re proud to have over three generations of experiences working side by side as a manufacturer and worldwide exporter of Iranian ORGANIC food products in all varieties and sizes of PREMIER quality of Organic Dates and in all kinds of packaging. We are also proud to have a comprehensive quality system for every stage in the production process: cultivation, management, storage, packing, transport, etc. In this way, we will guarantee our products quality that meets the highest international standards including ORGANIC– from the orchard to the store. All the organic Dates produced and packaged by us meet all the standards in the field of quality and food safety. Thousands tons of Dates are grown in worldwide every year. But Buyers in Dubai, France, China, India and other European, Asian, American and African countries also work with Iran. 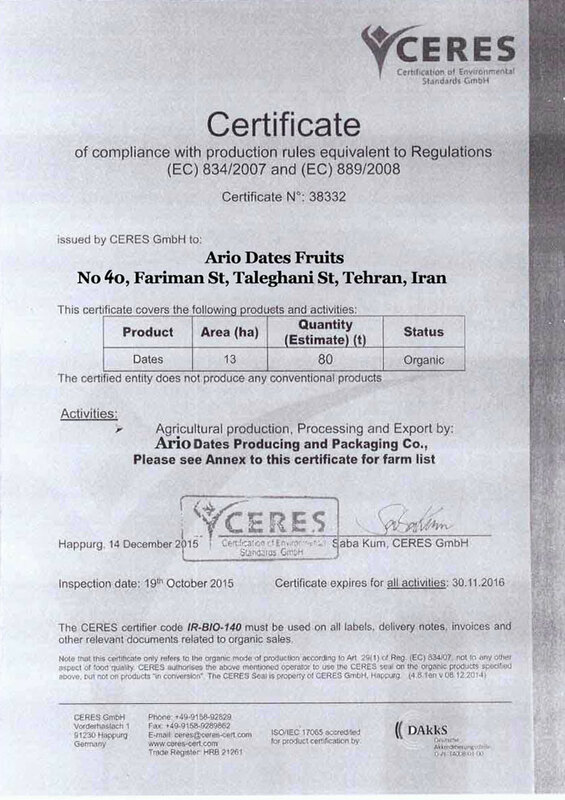 For us it’s absolutely vital that Iranian Dates meet the most stringent quality and environmental standards. For this reason, we trust with the crops and try to be trust in this way.This gives our customers confidence that we endeavor to offer them the best. Ario selects the location of its orchards carefully, so that the Organic Date can grow well without too much artificial support .Ario growers pay more attention to soil because healthy plant needs healthy soil. All the care that Ario devotes to Land selection and management is vital for guaranteeing the quality of the soil. For example, No chemical soil enhancers enter the orchard, and soil enrichment only occurs with the use of compost. The Organic date farmers also regularly monitor their soil to check whether its composition is balanced. By taking all these measures, we can cultivate more than 80% of the Date without the use of any pesticides. The Organic date palm must have full sun. It cannot live in the shade. It will grow in all warm climates where the temper nature rarely falls to 20°F (-6.67°C). When the palm is dormant, it can stand temperatures that low, but when in flower or fruit the mean temperature must be above 64°F (17.78°C). The Ministry of Agriculture takes samples in the Ario orchards and warehouses to check that our Organic dates do not contain any remnants of herbicides or pesticides. The Organic date can tolerate long periods of drought though, for heavy bearing, it has a high water requirement. Ario growers see to it that every Organic date palm tree is perfectly ripened before it is harvested, guaranteeing its optimal shelf life and taste. It is important for all organic dates to be picked at the same moment in the ripening process so as to obtain a consistent product with a uniform taste. To ensure this, strict standards are applied for picking. A grower divides up the orchard into various small segments. For every segment they make regular checks to see whether the Organic dates are ripe. This means that organic date fruit hanging in the sun will be picked at a different time to fruit in a shady part of the plot. Once picked, Ario Organic Dates are stored in environmentally friendly cold stores. The strict refrigeration temperature (0 to 4 C) ensures that the organic date “sleeps” and is ready for sale, without the addition of any chemical agents. Because Ario aims to work in as sustainable a manner as possible, we are constantly looking for ways of improving the energy efficiency in the cold stores. Ario Organic date packaging is 100% recyclable or re-usable. We use water-based printing ink. Ario also makes great efforts to make the packaging even more sustainable. Ario transports the organic fresh dates in refrigerated cargo containers and the organic dry dates in common cargo containers which are notably more environmentally friendly than container transport. We also continually try to optimize the route, so as to limit consumption. Ario Organic Dates only travels in ships with low energy consumption and advanced installations and techniques for the storage of our organic dates. This means we can be sure that the excellent quality of our organic dates is kept intact. Absolutely, Organic Dates Fruits are grown on suitable and natural environment, actually are handpicked from farms where are rich with direct sunlight, abundant current water, fertile soil and in one word organic Dates Fruit are the most natural kind of Date. The organic Date is fruit which have not been added any chemical material to its soil since three years after cultivation. Organic Dates have natural color which means they are neither richly colored nor pale, pleasant taste and odor which is the most obvious factor to distinct organic Date from non- organic Dates. Organic Dates actually are the healthiest sweetener ever! They are not loaded with vitamin C but are rich in iron and fiber. The organic Date should be kept away from foods such as onion, fish and also oil production because may attract their odors. All of Ario Organic Dates are delicious ,safe and also are rich sources of high Nutrient, Minerals ( Calcium, Iron, Magnesium, man genus, Phosphorous, Potassium, selenium, sodium) , Vitamins( A, B9, C), Fatty acids ( Omega 3, Omega 6), Protein, Dietary fiber, Antioxidants so we trust which all of Organic Dates can help and raise the immune system against diseases. Have you ever thought that D.D.T is one of the most dangerous agricultural pesticides? can also be transmitted from mother to child. This is really an alarm!! !Do you also know that provided researches have shown that the organic Date Fruit is very beneficial for pregnancy period and women which are breast- feeding? So we can believe that the health of crops and the development of organic farming have been highly regarded. We can mention too much medicinal benefits of Organic Dates for you but in this article, we only mention some of them and we are going to pay more attention to Organic Dates. Diabetic: All of Iranian Organic Dates especially Organic dry dates (Organic Piarom Date, Organic Rabbi Date, Organic Zahedi Date, Organic Sayer Date) have natural and low sweet so they are excellent food sources for diabetic people. The Health Body: All of organic Dates have high amount of Calcium, Phosphorous, Magnesium and vitamins which are necessary for healthy body. Anemia: Iranian Organic Date because of being rich source of Iron is one of the best way for treatment of Anemia and those who are suffered from this disease. Athletes: Organic Date fruit also is considered as a nutritious food which is beneficial for those who exercise seriously. Digestive System: Its fiber content has positive and direct influence at digestive system functions and can be used as a fruit which is useful for all age groups. Antibacterial: This nutritious food can help to prevent fat accumulation and because of having beneficial substances can strengthen immune system against diseases .Date fruit consumption helps to regulate Thyroid gland and also is antibacterial. Better Digest: This food causes to digest food better and also its calcium content is the main factor for bone strength. Laxative Drug: The doctors believe that daily consumption of Organic Date fruit can remove severe constipation and works as a laxative drug! Blood Circulation: Organic Dates are better to eat every day because it will help to better blood circulation. Of course it should be noted that excessive Organic Date consumption can lead to high blood pressure and cause to weight-gain and decay. This semi-dried grows in Hormozgan region. The coloring of this kind is dark brown and it has a unique taste. The skin of Organic Piarom date is thin. The Organic Piarom date has a kind of sugar which is acceptable for diabetic people. This semi-dried Organic date grows in the Khozestan region. The coloring of this kind is dark brown and it is purchased by many countries. This Kind of Dates, are Original from Southeast of Iran from Sistan-va-bal. State grows and removal crops in Semi-Dried types. The color is attractive Black Color. This Organic dried date grows in Fars and Khozestan regions. The coloring of this variety is yellow. Organic Kabkab Date is Wet Date with Semi-Dried Texture .This Organic date grows in Fars regions. The coloring of this variety is black and its taste is very delicious.